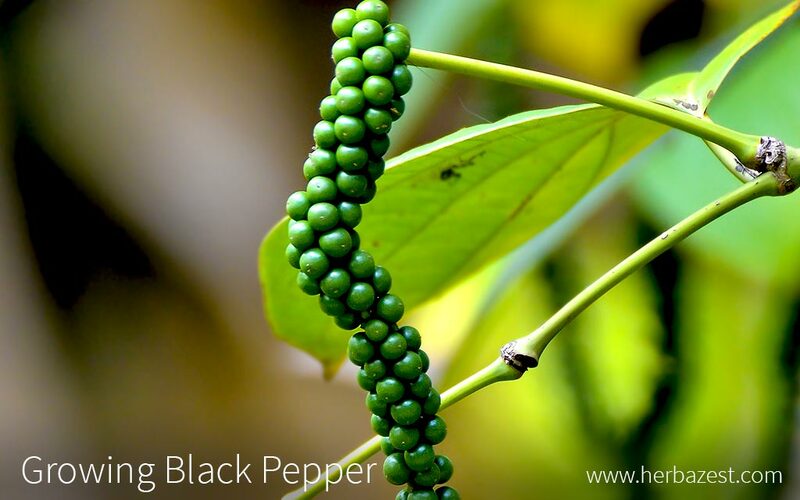 Commonly referred to as “black gold” because of its utility as a form of commodity money throughout the ancient trading world, black pepper has evolved as a promising crop with a variety of useful qualities. Indulge in its many uses by finding out how to grow pepper vines below. Climate, support systems, soil conditions, and water needs are just some factors to take into account when learning how to grow black pepper plants. The following growing guidelines will help you to create a proper environment in order to succeed in black pepper cultivation. Black pepper vines can grow in a wide range of soils, but do best in well-drained, loamy soils that are high in organic matter, with an ideal pH of 5.5 - 6.5. Humus-rich soils are ideal for growing black pepper. Before planting, the area should be cleared from any weeds and debris, as well as carefully tilled and hoed in order to loosen the soil and make room for black pepper's root system to grow healthy. Black pepper is a flowering, woody perennial climbing vine that needs some shade to thrive. In India, where this crop is cultivated on a large scale, it is usually grown supported by trees - which also protect it from excessive sunlight - in coffee, cardamom, and tea plantations. While black pepper vines can tolerate 50 - 104°F (10 - 40°C), the ideal temperatures for cultivating this crop are within the range of 73 - 89°F (23 - 32°C), with an average of 82°F (28°C). They require warm weather, with high relative humidity, and will not withstand excessive heat and dryness. The best time for planting black pepper vines is at the beginning of the rainy season. Light showers that happen in the spring (May through June), when the plants begin flowering, help with fruit set. In general, the fruits mature six to eight months after flowering, and harvest usually falls from December to January. This period coincides with the dry season in India. The vines require living or nonliving standards for support and successful growth. The height of these standards is not restricted, but shorter structures allow for easier harvesting of the fruit when ready. Two to three rooted cuttings are planted individually in each pit around the standards. If using unrooted cuttings, four to five should be planted per pit. The space between the row and the plants should be at least 20 square feet (6.25 m2). As the cuttings grow, the shoots can be tied to the standards as needed. Pepper can be propagated by either seeds or cuttings. However, for commercial production, rooted cuttings are preferred. They are raised mainly from the horizontal stems growing above the ground from the parent plant - or runner shoots. However, terminal shoots can also be used. Black pepper vines can be grown indoors and transplanted outside in the spring or when conditions are mild. Overall, the best soil temperature for optimal root growth is 79 - 82°F (26 - 28°C). In general, black pepper vines require an extensive area for their root system to flourish. Lateral roots can penetrate the soil to a depth of 6.5 feet (2 m). Therefore, if planting them inside, use at least a seven-gallon pot (about 27 L) with space for the artificial support. Care should be taken to ensure proper soil conditions and pH level. If propagation is done through seeds, they need to be planted half an inch (1 cm) below the soil surface. The vine should be provided with adequate amounts of water; however, the potted soil should not be allowed to retain water, or it will become soggy and kill the plant. Add fertilizer as needed according to soil consistency and the variety of pepper. Black pepper cultivation require annual rainfall amounts of 78 - 118 inches (2,000 - 3,000 mm). The distribution of the rainfall also plays a role in the growth process. There should be sufficient rainfall to trigger flowering processes in the plant until the fruit is ripe. Dry spells within the flowering to fruit ripening stages (about 16 weeks) will result in low yield. Irrigation is particularly important during the summer months. It can be done weekly by using a hose directly at the base of the vines. The amount of water needed will depend on the plants' stage of development. Vines 5 - 10 years old will require around eight gallons (30 liters), while for plants that are 11 - 15 years old, 10.5 gallons (40 liters) fortnightly are recommended. The soil should be tested before determining the type and amount of fertilizer to apply. Dosages increase gradually until the third year, which is when the full dose is given onwards. Fertilizer should be applied about 12 inches (30 cm) away from the vine all around it, and must be covered with a thick layer of soil. Direct contact with the roots must be avoided. Black pepper vines should be pruned within the first four to six months of planting in order to encourage the development of lateral shoots. This also increases yield. Unwanted terminal growth should be pruned to boost further development of lateral shoots and spike production. Mulching black pepper vines helps conserve moisture as well as protect the roots. The feeding roots are located in the top 20 - 24 inches (50 - 60 cm) of the soil, and certain types of mulch help prevent soil erosion. Using an appropriate cover crop according to region of production can also help smother weeds and reduce infections among vines. A big part of how to grow black pepper is to learn about all the possible dangers the plant may have to face during its development. There is a myriad of insect pests and diseases that can damage black pepper vines. Learning how to identify them will make the growing process simpler. In Asian production, the pepper flea beetle wreaks havoc because the larvae eat out the fruits. Pepper weevils and top-shoot borers are known to cause damage by feasting on developing fruits and shoots. In order to prevent infestation, vine pruning is beneficial because it shortens the flowering and fruiting period, additionally reducing the time in which spikes are exposed to insect attacks. The formation and spread of the cucumber mosaic virus can greatly affect peppers, causing ring-spot patterns in the lower, mature leaves. It is spread by many aphid species in a non-persistent manner, meaning insecticides can't help fight it. To prevent cucumber mosaic virus, it is advised to plant black pepper away from weedy border areas, or grow them next to taller border plantings that can function as a non-susceptible barrier crop, such as sweet corn. Mineral oil sprays may also be used to interfere with transmission of the viruses by aphids. Other common black pepper plant diseases include potato and tobacco etch viruses, as well as pepper mottle. Besides pests and diseases, take precautionary measures against the possibility of other animals eating pepper vines and other plants within the field. Even though pepper vines begin flowering the first year, the first harvest generally happens the third year after planting. When one or two berries turn yellow, they are all collected by hand. This will ensure even and uniform growth the following season. Whether or not they are all mature, berries should be removed annually in order to encourage new growth and better harvests in subsequent years. Once the stalks filled with fruits are harvested, they are kept in bags for 12 - 24 hours or covered up overnight for brief fermentation. This makes the removal of the berries easier. The stalks can be threshed manually or mechanically to separate the berries. After being harvested, the fruits, also known as drupes, are sun dried to separate the peppercorns. Even though the plant is widely known as black pepper, three different colors can be created from a single drupe depending on when the berries are harvested and how they are processed. The freshly harvested, unripe berries are freeze-dried to make green pepper. Drupes that are picked when at adult size but are still green are sun-dried and transformed into black pepper. When drupes are slightly riper, they're used to produce white pepper. Whole peppercorns should be heavy, compact, and free of any blemishes. They should also be stored in a glass container in a cool, dark, and dry place. Whole peppercorns will last almost indefinitely, while ground pepper's flavor will stay fresh for about three months. For a fresher taste and flavor, it is best to grind the peppercorns right before consumption. Regardless of the variety of peppercorns (green, black, or white), freezing them is also an option; however, it should be noted that by doing this, their flavor will become more pungent. Correctly raising and training black pepper vines takes time in order to to reap a bountiful harvest. However, under the right conditions, growing this spicy treasure on a smaller scale in a home garden is also quite possible and rewarding.